I aim to stimulate and fascinate leading you on a journey infused with fresh insights, cultural performances, fun, stylish activities, outstanding food and drinks, through off-the-beaten-tracks as well as hot spots. But always to the beat. Rough it, ease it, lux it. What sets me apart from the majority of the guides out there is my years abroad. I have lived and worked both in Turkey and abroad. On the other hand, having lived and worked in foreign lands, on top of my extensive travels around the world as a passionate traveler equip me with the international flair and understanding of different cultures and expectations. I constantly visit, participate in, follow up and keep updated on places and activities. I do not only talk the talk but also walk the walk! The pace of change in Turkey and Istanbul is unmatched! What is there a year ago may no longer be there now! What was superb three months ago may no longer prove to be so! There is always a better place, a brand-new activity, just another person to meet and a novelty transformational experience. I have the capacity to arrange multi facets of your travels in Turkey using the best service providers with respect to your needs and wants. I have been working as a Licensed Nationwide Professional Tour Guide all over Turkey since 1991. I have hosted people from all walks of life including highest caliber personas. Both my guiding and travels around the world has a wide spectrum of activities and styles from the most adventurous down-to-earth kinds to the lap of the ultimate luxury. I know how to cater to luxury seekers! I have been there myself. Luxury is not only providing the exclusivity and the pampering amenities and surroundings but also reading the mind of my guests, knowing their expectations and leading them to transformational experiential activities. My background in the filming industry provides me with extensive insight information about locations, sites, museums and service providers all over Turkey. It gives me extra insight for locations that would not have been otherwise accessible to me unless I had been there for filming. My oral and written interpretation and translation capacities in the Turkish and English languages complement my understanding of the culture and expectations of my guests. My hands-on interest in certain arts, sports and gourmet events equips me with further capacities to follow and understand and lead. My goal is not only to give you the history and the highlights of the place, but also to convey the buzz of the spot, leading you to the living parts, following the beat… In just the way you like it; we can travel light and high or dive deep. Rough it or ease it! Luxe it on a plan or wing it! Maybe a mix of the two? It is all familiar territory to me. No matter which way, as a connoisseur next to you I will lead you through transformational experiential travels without you having to worry about sorting out if you prefer to wing it as you go. Just enjoy! I will make it easy for you to take it easy! 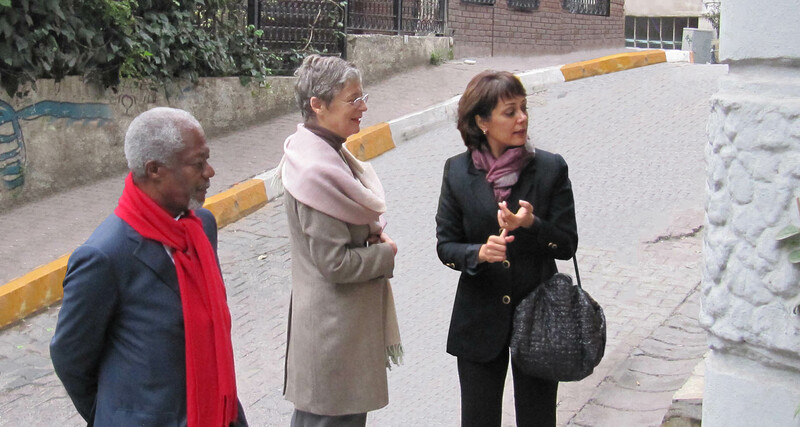 I had the pleasure of hosting people from all walks of life including famous personalities such as Mr. Koffi Annan. I am familiar with VIPs and their level of expectations and behaviors. According to Turkish legislation, it is illegal to provide guiding services in Turkey without holding a professional guiding license from the Ministry of Culture and Tourism. Only Turkish citizens are allowed to provide guiding services in Turkey. The license is given only after the completion of an extensive education and training program, passing several relevant exams and holding certain qualifications. The license must be registered and renewed every year. There are two types of licenses: national and regional. Not all guides have a national guiding license allowing to guide in all parts of Turkey. Guides can only provide their guiding services in the language/s specified on their licenses. Besides the registration and licensing with the Ministry, all guides must register with the relevant city’s Chamber of Guides’ (such as IRO in Istanbul) and state every year whether they will be an active guide within the specified year. In other words, not every licensed guide is allowed to guide! They must have stated at the Guides’ Organization that they will be an active guide for the specified year.